The purpose of this study is the deposition of nanodimensional Al2O3 films on the surface of nanoporous silicon and also fundamental investigations of the structural, optical, and morphological properties of these materials. Analyzing the results obtained here, it is possible to state that ultrathin nanostructured Al2O3 films can be obtained in the form of threads oriented in one direction and located at a distance of 300–500 nm from each other using ion-plasma sputtering on a layer of porous silicon. Such a mechanism of aluminum-oxide growth is conditioned by the crystallographic orientation of the initial single-crystalline silicon wafer used to fabricate the porous layer. The results of optical spectroscopy show that the Al2O3/por-Si/Si(111) heterophase structure perfectly transmits electromagnetic radiation in the range of 190–900 nm. The maximum in the dispersion of the refractive index obtained for the Al2O3 film grown on por-Si coincides with the optical-absorption edge for aluminum oxide and is located in the region of ~5.60 eV. This fact is confirmed by the results of calculations of the optical-absorption spectrum of the Al2O3/por-Si/Si(lll) heterophase structure. 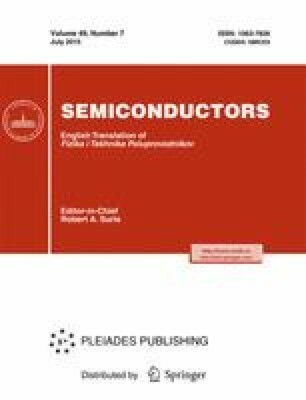 The Al2O3 films formed on the heterophase-structure surface in the form of nanodimensional structured threads can serve as channels of optical conduction and can be rather efficiently introduced into conventional technologies, which are of great importance in microelectronics and optoelectronics. Original Russian Text © P.V. Seredin, A.S. Lenshin, D.L. Goloshchapov, A.N. Lukin, I.N. Arsentyev, A.D. Bondarev, I.S. Tarasov, 2015, published in Fizika i Tekhnika Poluprovodnikov, 2015, Vol. 49, No. 7, pp. 936–941.